Creo’s Six Degrees brings messages and files together. Take any two people and give them the same task (such as finding a file on a network and e-mailing it) and you’ll find that each person employs his or her own unique procedure. For example, I right-click on the Start button and choose Explore, navigate to the file manually, right-click the file and click Send. Any other rational person might simply open a new message and attach the file by navigating through the Browse window from the e-mail client. Regardless of how the task is accomplished, a relationship now exists between the message, the sent file and the recipient. Now, eight months down the road, ask the same two people to find that file they sent, as well as the recipient’s phone number. Easier said than done, isn’t it? Creo’s Six Degrees is a productivity tool that watches and builds relationships between e-mail messages, files and people?taking the onus off of you to try and recall names and sift through your Sent Items folder to recover that information. I hoped that Six Degrees would free me from e-mail Hades. On average, I spend about 75 percent of my day in e-mail and I rarely archive, which bespeaks my 189MB Sent Items folder. I installed Six Degrees without incident. In fact, the install noticed an updated version and offered to download it, which I allowed. 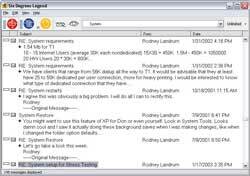 The next step was to build the application’s local database of relationships by indexing folders in my Microsoft Exchange mailbox. I chose to index three folders: Inbox, Sent Items and Writing, a folder in which I keep all writing projects. I started at around midnight and went to bed because the application said it could take some time depending on the number of messages. In the morning, it was completed. After watching the tutorial and reading the online help, I dove headfirst into the Six Degrees interface. Right away, it felt awkward, mainly because I was so comfortable working directly in Outlook. After working with Six Degrees for a while, I realized the problem: I was trying to make the application work just like me and adhere to my expectations of relevance in messages, people and files. I could type in the word “infrastructure,” and Six Degrees would accurately find messages and display them, along with the people who sent them to me and/or the people to whom I sent them. The list was long enough to be cumbersome. Narrowing that list to messages containing the word “infrastructure,” sent only my by boss “Jim,” and related to “bandwidth” would require a new search. I could also change the focus to just “Jim,” which would display all e-mails and people Six Degrees thought were related to Jim, again changing the focus of the original search. My bulldog approach simply wouldn’t work. Six Degrees is a handy tool and has many nice, though sometimes subtle, features, such as the ability to be always on top and to auto-hide while you work. 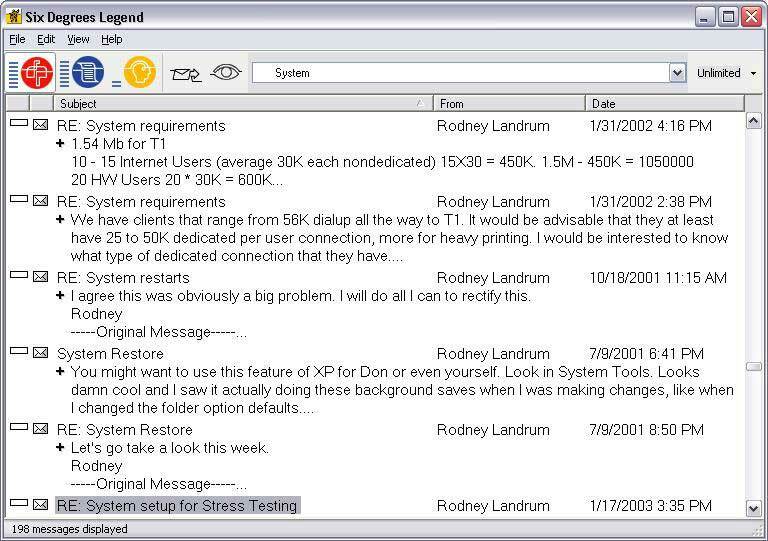 The radical change in “culture” with Six Degrees was too much for this old dog; but if you like learning new tricks (and are looking for an alternative to Outlook’s Advanced Find functionality), check it out.